Situated on the fall line, Georgetown was the farthest point upstream that oceangoing boats could navigate the Potomac River. In 1632, English fur trader Henry Fleet documented a Native American village of the Nacotchtank people called Tohoga on the site of present-day Georgetown and established trade there. The area was then part of the Province of Maryland, a British colony. George Gordon constructed a tobacco inspection house along the Potomac in approximately 1745. The site was already a tobacco trading post when the inspection house was built. Warehouses, wharves, and other buildings were then constructed around the inspection house, and it quickly became a small community. It did not take long before Georgetown grew into a thriving port, facilitating trade and shipments goods from colonial Maryland. In 1751, the legislature of the Province of Maryland authorized the purchase of 60 acres (240,000 m2) of land from Gordon and George Beall at the price of £280. A survey of the town was completed in February 1752. Since Georgetown was founded during the reign of George II of Great Britain, some speculate that the town was named after him. Another theory is that the town was named after its founders, George Gordon and George Beall. The Maryland Legislature formally issued a charter and incorporated the town in 1789. Robert Peter, an early area merchant in the tobacco trade, became Georgetown’s first mayor in 1790. Col. John Beatty established the first church in Georgetown, a Lutheran church on High Street. Stephen Bloomer Balch established a Presbyterian Church in 1784. In 1795, the Trinity Catholic Church was built, along with a parish school-house. St. John’s Episcopal Church was built in 1803. Banks in Georgetown included the Farmers and Mechanics Bank, which was established in 1814. Other banks included the Bank of Washington, Patriotic Bank, Bank of the Metropolis, and the Union and Central Banks of Georgetown. 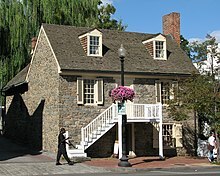 George Washington frequented Georgetown, including Suter’s Tavern where he worked out many land deals from there to acquire land for the new Federal City. A key figure in the land deals was a local merchant named Benjamin Stoddert, who arrived in Georgetown in 1783. He had previously served as Secretary to the Board of War under the Articles of Confederation. Stoddert partnered with General Uriah Forrest to become an original proprietor of the Potomac Company. Stoddert and other Potomac landowners agreed to a land transfer deal to the federal government at a dinner at Forrest’s home in Georgetown on March 28, 1791. Stoddert bought land within the boundaries of the federal district, some of it at the request of Washington for the government, and some on speculation. He also purchased stock in the federal government under Hamilton’s assumption-of-debt plan. The speculative purchases were not, however, profitable and caused Stoddert much difficulty before his appointment as Secretary of the Navy to John Adams. Stoddert was rescued from his debts with the help of William Marbury, later of Marbury v. Madison fame, and also a Georgetown resident. He ultimately owned Halcyon House at the corner of 34th and Prospect Streets. The Forrest-Marbury House on M Street is currently the embassy of Ukraine. 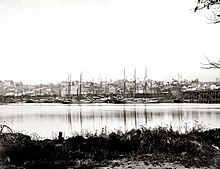 By the 1820s, the Potomac River had become silted up and was not navigable up to Georgetown. Construction of the Chesapeake & Ohio Canal began in July 1828, to link Georgetown to Harper’s Ferry, Virginia (now West Virginia). 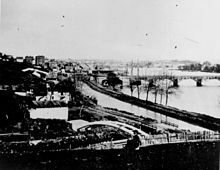 The canal was completed on October 10, 1850, at a cost $77,041,586. The canal turned out not to be profitable, never living up to expectations with construction of the Baltimore & Ohio Railroad. In 1950, Public Law 808 was passed, establishing the historic district of “Old Georgetown.” The law required that the United States Commission of Fine Arts be consulted on any alteration, demolition, or building construction within the historic district. Georgetown is one of the more affluent neighborhoods in Washington and home to many of the politicians and lobbyists. 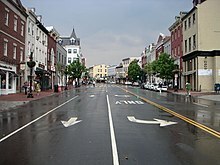 Georgetown’s landmark waterfront district’s was further revitalized in 2003 and includes upscale hotels such as a Westin, a Ritz-Carlton, and a Four Seasons. Georgetown’s highly traveled commercial district is home to a variety of specialty retailers and fashionable boutiques. Thomas Jefferson lived for some time in Georgetown while serving as vice president under President John Adams. Georgetown was home to Francis Scott Key who arrived as a young lawyer in 1808 and resided on M Street. Dr. William Beanes, a relative of Key, captured the rear guard of the British Army while it was burning Washington during the War of 1812. When the mass of the army retreated, they retrieved their imprisoned guard and took Dr. Beanes as a captive to their fleet near Baltimore. Key went to the fleet to request the release of Beanes, was held until the bombardment of Fort McHenry was completed, and gained the inspiration for “The Star-Spangled Banner“. Alexander Graham Bell‘s earliest switching office for the Bell System was located on a site just below the C&O Canal, and it remains in use as a phone facility to this day. Bell originally moved to Georgetown due to the numerous legal hearings related to telephone patents, but then later created the Volta Laboratory and stayed on due to the area’s profusion of scientific and technical organizations which became established in the region. Current residents include Secretary of State John Kerry, past Washington Post Editor Ben Bradlee, Washington Post Watergate reporter and current assistant managing editor Bob Woodward, former Secretary of State Madeleine Albright, and Montana Senator Max Baucus, among others.